The ICE blog serves as a platform for an open exchange of ideas among its many participants and contributors. Please join the conversation. Of the many mysteries of modern physics, few compare to “nonlocality” in quantum physics. Nonlocality means that far away objects can influence one another instantaneously (or at least much faster than the speed of light). It is as if space and time didn’t exist! “Influence” may not be the right word here; in fact, we don’t have a good word for it given that words are devices we create to express experiences anchored in our sensorial perception of reality. When a soccer ball hits the goal or a raindrop falls, we know that there is a local cause: the kick, the heavy raincloud. In the quantum world, where electrons and photons—the particles of light—inhabit, effects can occur without a local cause, something I explored before in one my NPR blogs, and in my book The Island of Knowledge: The Limits of Science and the Search for Meaning. Experiments have verified nonlocality beyond any reasonable doubt. Although experiments are made with particles such as photons and electrons, here is a human analogy from Seth Lloyd’s Programming the Universe: A Quantum Scientist Takes on the Cosmos. Twin brothers enter two bars, one in Seattle and the other in New York. If one asks for whisky, the other asks for beer; if one asks for beer, the other asks for whisky. The brothers can’t communicate, but always ask for the opposite simultaneously. We don’t know what they will order, but once one orders, the other’s choice is irrevocably fixed. Substitute now brothers for photons, and whisky and beer for vertical or horizontal polarization, and you’ve got the picture. In effect, it doesn’t make sense to treat the two photons as separate entities: they make an indissoluble whole, a single entity that “exists” across whatever distance they are pulled apart. Experiments have verified this for distances ranging from a few yards to about 100 miles and beyond in interstellar space! Transcending space and time rings of synchronicity, that visceral feeling that you are connected to someone or something in the past or the future, or that you guessed that this or that was going to happen, a mysterious link that seems to defy the laws of Nature, such as in premonitions or in Jung’s concept of synchronicity. Before we get too carried away though, it’s good to remember that the human brain and pairs of photons are very different systems. Be that as it may, very serious scientists such as Nobel laureate Eugene Wigner and his Princeton colleague John Wheeler have considered the role of consciousness in physics and to what point it determines the reality in which we live. When we measure something as small as the smallest bits of matter we must use a detector. We don’t have direct sensorial contact with an electron or with an atom. Their existence is registered when they interact with (the electrons and atoms of) a detector and we hear a click or see a pointer move. In the orthodox interpretation of quantum physics, known as the Copenhagen Interpretation, it is this interaction that determines the existence of the particle: before the measurement we can’t even say that the particle exists! In other words, according to this way of thinking about quantum physics, something only exists after it is detected. Wigner and Wheeler suggested that without an observer to set things up and interpret the results, without a consciousness with intent, this measurement wouldn’t make sense. This being the case, the particle’s existence is contingent on its interaction with the human consciousness. More dramatically and in italics, consciousness has an active role in determining what exists. But it gets even weirder. Wheeler imagined an experiment where a particle goes through a double-slit obstacle and then meets a screen. This screen is movable and can be taken away. Behind it, there are two detectors aligned with each of the two slits of the obstacle. This way, without the screen in the middle, the detectors can tell through which slit the particle passed. 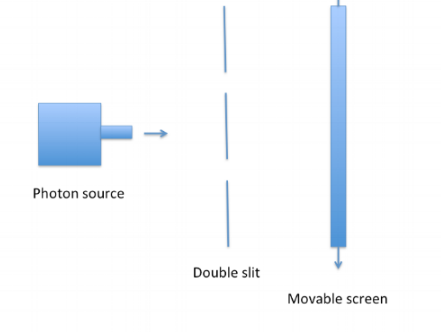 There are thus two options: with the screen, the particle (as a wave) “passes through both slits” and we see an interference pattern on the screen made of dark and light stripes; without the screen one of the two detectors will click when the particle hits it and the particle “goes through one slit.” Two very different paths, depending on the screen being there or not. So far, so good. This particle-wave duality is well-known. Wheeler added an amazing twist to this set up: take the screen away after the particle passed through the double-slit. This way, the observer controls whether the particle should create an interference pattern (as a wave) or just hit one of the two detectors (as a particle); the particle doesn’t “know” which of the two it will be, or which path it must take. In other words, the observer determines the physical reality of the particle (wave or particle) backwards in time! Remarkably, Wheeler’s “delayed choice” experiment has been performed and confirmed in 2006, and again with even more stringent controls in 2012. According to this experiment, observer and observed form an indissoluble whole that functions outside the boundaries of time. Note, however, that the observer need not be a human, but could simply be a mechanical control that moves the screen in an out. Still, the intent is human. As Wheeler put it: “We have a strange inversion of the normal order of time. We, now, by moving the [screen] in or out have an unavoidable effect on what we have a right to say about the already past history of that photon.” He goes on to suggest that similar experiments can be made across astronomical distances, measuring the light from objects billions of light years away, light that has left them before Earth existed. We don’t know if Wheeler’s intuition is apt or not, or if the extrapolation from particles to the universe even makes sense. Quantum correlations are fragile and hard to maintain. But his delayed choice experiment does make one wonder whether our existence defines the physical reality we live in, a possibility that surely horrified Einstein but that experiments seem to be making ever more compelling. We will have more to say about all this in future blogs. Can Science Fill the Spiritual Void?